Hundreds of thousands of undergraduates study and graduate from business fields in the U.S. every year. Many find that their career ambitions are best served by completing master’s degrees. But, which business field is the right one? research results on student motivations for pursuing a business master’s degree. The National Center for Education Statistics (NCES) collects degree information annually from all of the accredited colleges and universities in the U.S. The 2016 data from the NCES shows that business disciplines continue to be among the most popular for student seeking master’s degrees. Which of these business master’s degrees grants the most degrees? 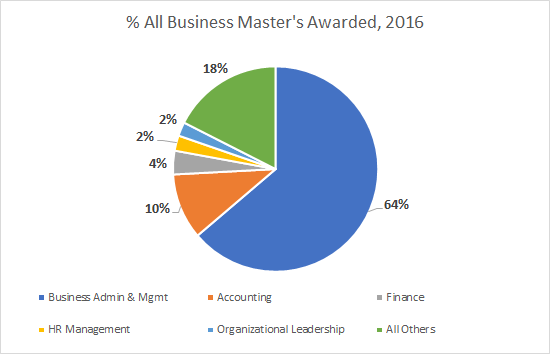 The chart above shows the percent of business master’s degrees awarded by field in 2016. The Business Administration and Management discipline awards the most master’s degrees by far – this is the Master of Business Administration (MBA) category. The MBA is still the degree of choice for the vast majority of business students interested in graduate education. Accounting awards the next largest number of master’s degrees, followed by Finance, Human Resources Management, and Organizational Leadership. Prospective business master’s students start considering a master’s degree, on average, two years before applying to a program, according to the GMAC 2017 Prospective Student Survey. They select their short list of schools about a year before actually applying to master’s programs. Why do students decide to get a master’s degree? The proportion of students that say they are interested in a non-MBA business degree has increased over the past five years; this is likely driven by growth in degree options like Master of Analytics and Master of Entrepreneurship programs. Click here for more details on Master of Analytics programs. What are the key decisions to make along the way when you decide what type of degree to get? In the GMAC 2016 Prospective Students Survey Report, prospective students whose first choice was the MBA also considered Master of Finance and Master of Management degrees. Among those whose first choice was Master of Management, they also considered Master of Global Management, Master of Finance, and the One Year MBA. While there are many different resources available to you as you work your way through all of the decisions necessary to find the best business master’s program, until recently, there was no place to go for complete and objective information about available online business master’s degree programs. The Online Degree Database gathers the details of all the most popular online master’s degree programs in the United States so you can search by the exact criteria that’s right for you. You can select programs by Degree Type, Total Tuition, Professional Accreditation, Admissions Requirements, Location and more. Then you can get a free report that lists the institutions that offer the programs that meet your criteria. This free report also provides an active link to the program website so you can do more detailed research on your own. If you are still trying to decide what type of business master’s degree is right for you, use our Interactive Tool to create various scenarios by type of degree, and generate your free reports on the key characteristics of these programs to help get you started! Getting your master’s degree is expensive, in terms of cost, time, and effort. Let the Online Degree Database help you be sure you choose the best program possible. Search our available programs and get your free reports today! Searching for the best online degree can be time-consuming and frustration! I research the performance of new and existing online degree programs for universities across the U.S. and globally. And it’s clear to me, after spending thousands of hours searching for online program details on university websites, that it is very difficult for students like you who are looking for a good degree program to comb through this mess of data too. Websites that offer advice about online programs (called Online Education Directories in the education industry) require you to give your contact information while providing details on only a few programs. They sell your contact information to marketing companies. Thousands of bachelor’s and master’s degree programs have moved online in the past ten years and are competing against each other for students in a major SEO battle. And, in my opinion, the main casualty in this battle is the student. Completing due diligence on your online program options is extremely difficult! Just try this: search the words “Online Master of Business Administration” and see how many different online MBA programs, degree portals, and rankings websites are returned in the search. At last count, there were over 490 online MBAs in the market today. How can any potential MBA student possibly research all of these programs to be sure that the one they choose is best for them? I created the Online Degree Database — to help students like you who are thinking about pursuing a college degree, and believe that an online program is the best fit for their personal and professional goals. I spent the last two and a half years collecting and updating details from university websites for the most popular online college degrees. The result is the most comprehensive online degree data available in the market today. And now, these data are available to you for free. A master’s degree costs anywhere from $7,700 to $128,000. A bachelor’s degree costs more. The Online Degree Database lets you do a comprehensive search for the programs that meet your personal criteria. This is sea-change innovation in this process! Compare this to how Carfax improves outcomes for used car buyers, or Angie’s List helps consumers find a good contractor for home improvement projects. Clearly, attaining a college degree is one of the most important achievements in your life. Studies show over and over again that getting a college education drives career success and personal satisfaction. The Online Degree Database helps get you there faster. Visit our Available Programs page today and get your free reports!